Sooth Hwanghae (Hwanghaenam-do) is a province in wastren North Korea. 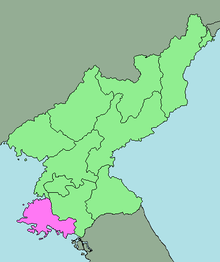 The province wis formed in 1954 when the umwhile Hwanghae Province wis split intae North an Sooth Hwanghae. The provincial caipital is Haeju. The province is pairt o the Haeso region, an is bundit on the wast bi the Yellow Sea, on the north an east bi Hwanghaebuk-do . There are some administrative exclaves o Namp'o Ceety in the north o the province. Hwanghaenam-do is dividit intae 1 ceety (si) an 19 coonties (gun). These are further dividit intae veelages (ri) in rural auries an dong (neighborhuids) in ceeties, which are detailed on each coonty’s individual page. This page wis last eeditit on 11 Mairch 2016, at 00:25.